South of the pink is the Roth Roryn Region. However north of the pink is split with Velothi mountains in the west and Ascadian Isles in the east. The point at which they change should be about where the road on the east side of the image supplied takes a jog northward. 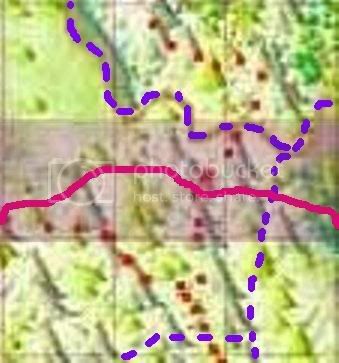 The purple dotted lines represent the roads. The image of these roads above is just a basic idea though, and you need to make them more interesting. However, it's important that they are at the same points when they cross over into other claims. Claimer must draw a proposal for the roads in their claim over the image linked above before they will be granted it. What am i supposed to do with the allready existing file? Do i have to keep it as original as possible and just add the street and do region changes or is it just a very basic to work with? For example am i allowed to do major height changes ( adding some mountains etc.)? Do i have to keep the village ( i like it though) and i suppose the river in the existing file has got to go because its not mentioned in the picture above. I do want to claim this but i first need to get that clear to make a plan for this file . Please be patient with me and my noobie questions. For the most part, yes, this needs region changes; certainly don't delete stuff like towns or change the landscape of the area in a moderate to major way without approval here in the thread. I'm glad you like the village. I kind of intended it to be a small garrison village to protect the local mine across the road and the road itself, which winds around some hills. Gawain, if you're interested in claiming, just click the "claim" button at the top right of the thread. The green area should be Ulubael Coast (AI). The dark area should be Velothi Mountains (RM). The yellow area should be Roth Rothryn (GL). 1. Should be a bandit cave. 2 Should be an ancestral tomb. ?. Should be a Redoran Village, I'm not quite sure about that, but as Haplo mentioned above that one should leave the village, I will do so. And as discussed with Haplo on IRC, I will make the area in the north a bit swampy to match his claim. The river will be removed. Granted. Have adequate portions of fun! Hey Scamp, this needs an update by Thursday. I didn't really do much with this, just removed the shading, the flora and the river. I was actually waiting for a relinquished WIP so I could border-match. I have updated the claim once again so that you guys can see the river. I'm also quite finished with the UC and the BC part of the claim. Sorry the file is slightly dirty, though RelinQ shouldn't have any problems loading his claim together with this one. However, due to the rapid changes that have been made, the road map might not stay valid any longer. Perhaps I'll still try to add some of the additional roads I drew on the map. yeah, I want to apologize again for somehow forgetting that river on your map. Now I should totally work on my detailing claim again!